Natalie Bork’s work seems to challenge the notion in which paint is used. There is no clear, visible canvas—in fact she applies the paint to a metal sheet that is bent into rolling curvature shapes. Some are square in nature, others long and tall. One of her pieces was a round cylinder hanging from the ceiling of the gallery. It was interesting to me that she took one of the main principles of painting and applied it in an extreme way: the layering of paint. Paint is layered to create depth and value change in a painting. Bork uses the thickness and the body of the paint to create a surface. It is many times the thickness of that on a regular painting. In a way her works become more like a piece of sculpture, further seen in the way she subtracts from the paint, exposing layers beneath and the colors, giving it a strata effect. Also places where the paint dried and became unstable cracked. There is the essence of controlled removal and the uncontrollable removable of the paint. The piece that intrigued me was Reflection. In this work the carvings flow almost like a river or surface of water. The colors are blue and purple, also with smaller dashes of yellow and orange. There colors all compliment one another, they are opposites on the color wheel. It reminded me of the shimmering light from a sunset on a body of water. The shape of this piece is different from her others. It is long and thin, the sculpted lines running lengthwise, acting as a sort of grain through the piece. The student work from the Rowe Gallery that I chose to look at is Resisted Definition by Michael Haag. This piece consists of a figure made from an interesting combination of material, plaster and hay. The figure itself seemed to be reaching out, it has its eyes shielding. The impression I got was that it looked like someone in distress. The title Resisted Definition conveys that there is a struggle, some sort of distress. This can be seen in the composition of the figure. Also the second part of the title, “definition” is realized I think in the materiality of the piece. Plaster is a binder. It holds the hay together. However, the hay does not mold well and the long pieces stick out from the form. This results in a less defined shape of the figure. It also seems to become less defined towards the bottom of the sculpture—the hay looks like it is dripping in the plaster. I really enjoyed this sculpture because of its gestural quality. 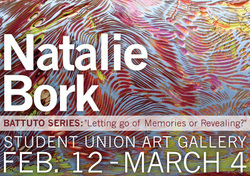 I chose to focus on Natalie Bork's work for this visual response. Although I could't duplicate the actual technique of using dried acrylic paint, I attempted to mimic the affect and colors using colored pencil. In her pieces the areas where she removed and sculpted away the paint, appear as small line segments or dashes of color. I used this idea to draw a picture of an Iris flower. I think that colors blend very nicely together and read almost like one of her works.